At The MentorShift Group, we believe strongly in the value of process. The four-step MentorShift process, KNOW. SHOW. GROW. GO, is at the heart of The MentorShift Group’s training system and through its use, produces excellence in mentoring across organizations. The process is immediately relatable, usable and actionable. 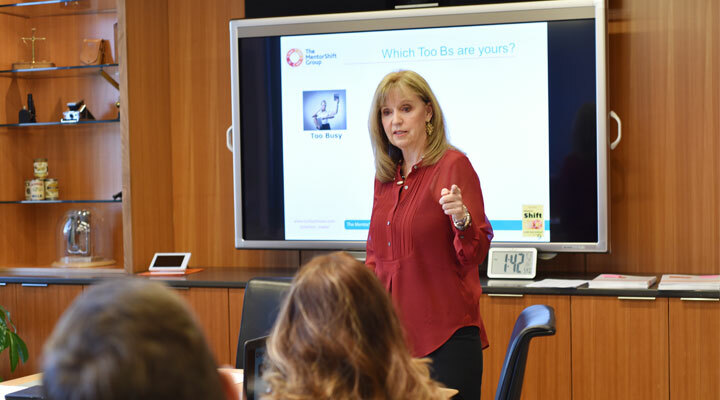 Workshop participants begin to see how these steps apply and how effectively they transfer any skill —inside and outside the workplace. In consonance with Lori’s book, MentorShift, the workshop moves mentors and mentees from what could feel like a directionless place to becoming at ease with a mentoring process they can use now and in the future. The workshop is available in either two-hour or extended four-hour timeframes.